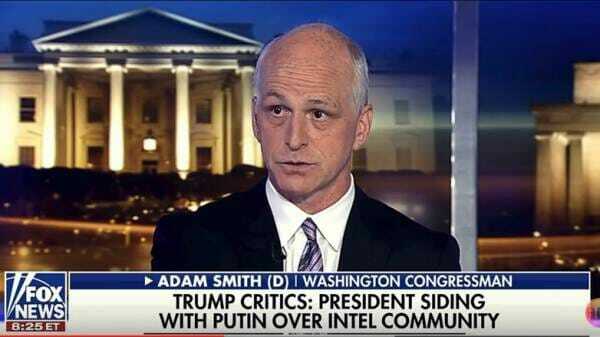 Far left Democrat Adam Smith went on Tucker Carlson Tonight to discuss President Trump’s meeting with Russian President Vladimir Putin. Adam Smith said the Russian crime was that they hacked into the DNC server and implemented a disinformation campaign. Rep. Adam Smith: The crime is they hacked into our DNC server and did a whole bunch of other disinformation campaigns to try to influence our election. A foreign power tried to do that. Also in this indictment it shows that the twelve Russian operatives had regular contact with high-ranking Trump officials. That’s news. Where the hell did it say that? Actually, Deputy Attorney General Rod Rosenstein said last week there was no allegation in this indictment that any American citizen committed a crime. Rosenstein said NOTHING about the twelve Russians having ANY CONTACT with ANY Trump official. This was just a blatant lie by Adam Smith trying desperately to link the Trump campaign to Russia… Something that Democrats, Mueller and the liberal media have been unable to do after a year-and-a-half of investigating. What Mueller’s team did say was that someone in “regular contact with senior members” of Trump’s campaign communicated with the Russian agents. Roger Stone wrote 24 words to Guccifer 2.0. He suspects this junk accusation is about him. Roger Stone and EVERYONE in the US had NO IDEA Guccifer 2.0 was a Russian. The remarks by Smith were completely false.